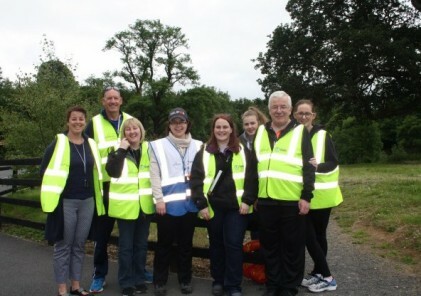 My friend Siobhan Kearney, Event Director of Tralee parkrun (and now my parkrun boss!) asked me if I would like to help out at this new weekly parkrun by taking some photographs. I said of course, as long as you don’t ever expect me to run! The rest is history. Well, not the running bit, that’s for sure! But I’m even getting to like that part too. Mostly, the buzz in our town park every Saturday morning. And of course, Bere Island! I like to meet a few new people every time I do a parkrun, whether at home or away! I can now count several hundred people as friends I had never met before I started parkrun. 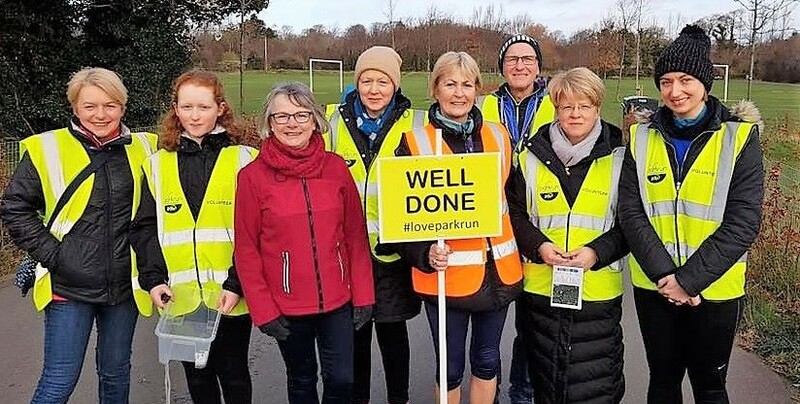 I was very honoured to be asked to join parkrun Ireland’s team of Volunteer Ambassadors last year. It has been great to be involved in the establishment of new parkruns in Kerry and beyond. Keep doing the weekly parkruns for as long as I’m able. As for losing a bit of weight, well, the whole cake thing puts paid to that notion! My friend Sophie, age 6, who designed the T-shirt in the photo below – and held up a sign as big as herself saying “Awesome Running!” at the half way point of my 100th parkrun, undoubtedly spurring me on to my precious PB! My real parkrun buddy that day was Sophie’s mother, Sharon, my personal pacer. (My running is anything but awesome). I’ve had 127 great experiences! In fact very many more as I’ve volunteered as often as I run. But the Tralee parkrunners on our trip to Bushy parkrun was very special indeed – so much so that we are going back again next year! Or maybe it was driving 1000km to do a parkrun in Buncrana? Too many to pick one. Five mad parkrunners dressed in feather boas singing a specially composed song, “Copacaparkrun” during the Run Briefing for my century parkrun! Barry Manilow would turn in his grave, but I loved it! You won’t regret it. It’s life-changing and fantastic in every way. The best money you’ll ever spend. Oh, I forgot – it’s free! We lost our son Paul, who loved parkrun, a few months after we started, and soon after that our friend and fellow parkrunner Nigel also passed away tragically. Our friends in Tralee parkrun planted a tree to remember Paul and Nigel at our start line and it is always there as a reminder of how parkrun, and especially the great friends I have made through parkrun, have helped me to get through some very difficult times. Thanks everyone.